So you thought agave nectar, relative of the Aloe Vera plant, is only used to make tequila? Well, just like the Aztecs who prized it as a gift from the gods and used “honey water” to flavor foods and drinks, it’s my secret ingredient to create prize winning competition ribs. So, check out my recipe with agave nectar which is virtually unknown to backyard cooks (well, maybe not after you read this recipe). Preheat your indirect smoker to 275 degrees. Add a couple of tennis sized wood chunks (I like a fruit wood like apple). Toss the wood onto the hot coals only after you put the rib racks in. Apply some regular yellow mustard on both sides of the rib racks. Spread it evenly. Only a thin layer is needed to help the rub to adhere. Apply about 2 tablespoons of SYD rub on each side taking care to apply it evenly covering all exposed surfaces of the rib rack. Let it sit for 30 minutes before placing into smoker. 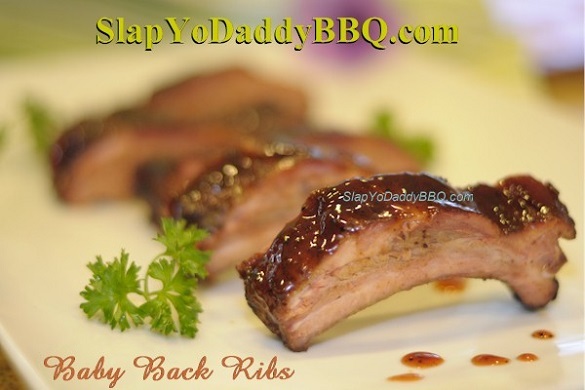 I use a rib rack as I like to cook my ribs upright to give it proper airflow and even color. If you don’t have a rib rack, just lay them flat on the grate about ½ inch apart. Spray the racks with apple juice after 90 minutes. Repeat every 15 minutes until the crust or bark is set on the ribs (about 2:15 to 2:45). Test that the crust has set by scratching the surface with your fingernail. If the crust has not set, the rub will come off in your nail. Check back after 15 minutes if it has not yet set. Tear off three sheets of heavy duty aluminum foil wide enough to wrap the ribs burrito-style (loosely by folding over the sides and then the top and bottom). Remove ribs once crust has set. Place a rack with meat side up in the middle of the aluminum foil. Apply an even coat of brown sugar. Use more or less depending on how sweet you want it. Drizzle on the agave nectar; about 1 tablespoon each side. Drizzle on the apple juice; about 1 tablespoon each side. Flip over so the meat-side is down and repeat with brown sugar, agave, and apple juice on the rib side. Wrap it burrito style so it can be opened easily later to check for tenderness. Check back in 1 hour and use toothpick to check for tenderness by probing each rack between the bones. The toothpick should penetrate easily into the rib meat. You can also tell by the amount of pullback of the meat from the bones. If not tender, check back in 10 minute increments until all racks are done. Combine ingredients to make BBQ sauce. When racks are done, remove from smoker and let rest for 10 minutes. Remove ribs from foil pouch and apply a thin layer of BBQ sauce on both sides and put back into the foil pouch to set the sauce. You may set the ribs in a igloo or warming oven to keep warm. The residual heat is sufficient to set the glaze. Cut into individual bones and serve. Question on the foiling of the ribs. After drizzling the brown sugar, apple juice and agave nectar on both sides of the ribs. When you wrap it up, do you leave the meat side down or flip it back up. Really looking to try this recipe as I’m also new to foiling. Thought if you leave the meat side down, that would make the bark rub off somewhat as it sits in the apple juice. Harry – I’ve been smoking now for about 4 years using a MAK pellet smoker. I used the above recipe EXACTLY – 275’F w/ Apple pellets. These were the best BB Ribs I have ever done. Tender/flavorful – great smoke ring / moist… Good Stuff! Thanks for sharing your wisdom. I also purchased your rub – excellent as well! You’re very welcome. Keep spreading bbq luv! Harry, when you say "agave nectar (dark colored variety)" are you referring to organic raw agave nectar? Maybe something like <a href="http://www.amazon.com/Madhava-Organic-Raw-Agave-46-Ounce/dp/B004T0D0RW/ref=sr_1_6?s=grocery&ie=UTF8&qid=1398219627&sr=1-6&keywords=agave+nectar" title="here">? Hey Terrence, any kind of agave will work. Just pick a reputable brand. Good luck! Apply more rub. You need to apply the rub until the meat cannot be seen and become opaque. Gently pat down. A medium coat of brown sugar is good. Best of luck! I like you Mr.Soo, a kind and generous soul will reap what he sows. Good things are ahead for you! Thank you for your kindness and support! Keep barbecuing and spreading joy! Harry- what is the ‘wrapping glaze’ listed and where is it used in this recipe? Thanks. The wrapping glaze refers to the residual juices in the foil mixed with the BBQ sauce you applied on the ribs. gently scrape with your fingernail. If it’s wet, leave it alone. If it’s dry, go ahead and wrap in foil. If you foil too early, you will know as your rub will fall off. If you foil too late, the ribs can be dry or oversmoked. Good luck! Made these on 4th of July for the first cook on my new WSM after seasoning. The temperature was a little hard to control from one spritz of apple juice to another but overall they turned out quite good. I think they could have been a bit more moist could I have managed the temperature a little better. It seemed every time I sprayed with apple juice the temp would jump to 290+ for a good 10 minutes even with all vents closed. I’m sure the more I cook the more stable it will get…hopefully. Thanks for sharing this delicious recipe. I’m a little confused on the time of this cook, at the top it suggest 3 hours cook time. After reading the direction the ribs are in the smoker for 1.5 hours then spray with apple juice every 15 min. until crust is set, about the 2.5 hour mark, then take off and foil. After returning them back to the smoker foiled it says to cook another hour. Wouldn’t that be at least 3.5 hours of cook time? The total cook time is about 4-5 hours. It’s 2.5 to 3 hours to reach the foil phase. Even the photo is drool-worthy! Wow. I have to try this once the weather warms up. Question–I have the 18" Weber Smokey Mountain, and if I use a rib rack, I can of course stack quite a few ribs in it. But if I foil them and lay them flat, I could run out of space. (This is only if I would be doing a full load for a party.) I can barely squeeze two full baby back racks on the top, flat, and only if they are cut in half. Would it work to return the foiled ribs to the rack (provided the sealed foil is facing upwards)? Or would I be better off loading some on the lower smoker rack? And as I understand it, are you doing your ribs with the water bowl empty? After I foil my ribs, I put them on a cookie sheet and pop them in my kitchen oven set to 275F. 30 minutes before my guests arrive, I transfer the foiled pouches and stack them in my WSM. I toss in fresh wood chunks to generate smoke and then dab some barbecue sauce on my apron. I spray some water on my face before I greet my poker buddies. I tell them that I spent the whole day cooking Q for them and to please let a generous tip for the cook! That’s how the pros do it. Shhh don’t tell them. This recipe is amazing. It is the only way I smoke ribs now. My family and friends love it. They no longer order ribs from restaurants, because they like these the best. I follow Harry’s recipe exactly. Happy Smoking! Hey Bill, glad to hear you and your family like my recipe. Keep spreading BBQ love. Send me a pic sometime and I’ll repost of FB. Thanks. If you have to do your cook early, about 8 hours before they are to be served, what is the best method to store them to keep them juicy? Once the ribs are foiled, do you keep them in the foil + in the juice until its ready to be served and just reheat it in the same original pouch? I am assuming they go into the fridge for the 8 hours? Keep in foil pouch and put warm oven set at 150F until ready to serve. If you want to refrigerate, cool, and then put in fridge. Still my fav way to do B.B. ribs. While fam made Christmas cookies in Kitchen, I smoked 6 racks on WSM 18.5 with rib rack. Instead of usual wrapped heat pan, I used water bowl because I was concerned about hot spots drying out some as I had so many in the wsm. I used a cup of apple cider vinegar with water in bowl (not sure if much impact, but just cooking by instinct). Usual kingsford blue and apple wood…rotated racks twice for even cooking…followed Harry’s instructions above 100%, with his Rub. Beautiful, perfect. Every rack was perfect. Thrilled. Thanks Harry! So glad I bought the big bag of rub. I use it often. Yummy. Thanks for the shoutout. Glad every rack was perfect. Keep spreading BBQ love. I appreciate you sharing your knowledge. Can you recommend a good rib rack? Thank.